The 9th Circuit Court of Appeals recently changed its mind about whether the Grand Canyon Trust and other plaintiffs can challenge the government’s decision to exempt a uranium mine from a 2012 ban on new mining claims on more than 1 million acres of public land surrounding Grand Canyon National Park. The new decision should land the case back in the U.S. District Court in Arizona to resolve our arguments challenging the U.S. Forest Service’s finding that Energy Fuels Resources Inc. had a valid right to operate the Canyon uranium mine before the ban. 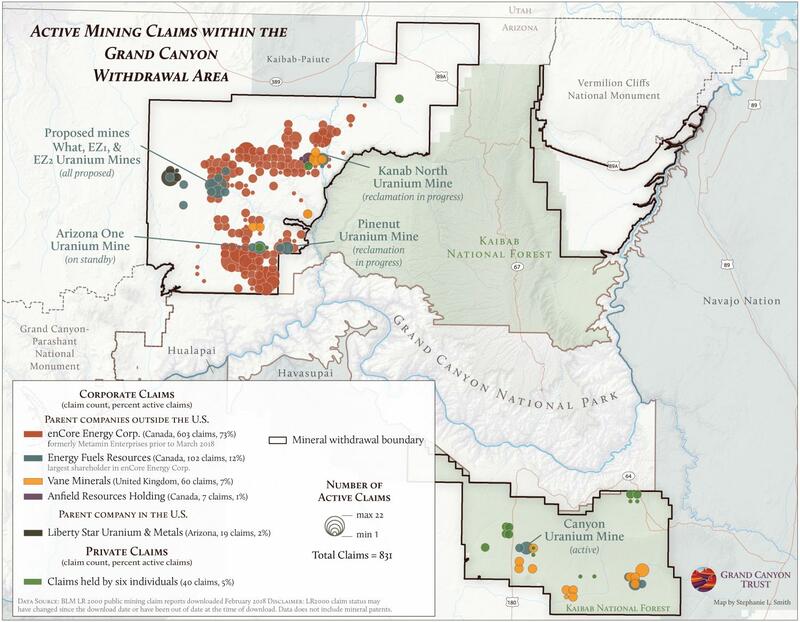 Active mining claims in the footprint of the 2012 Northern Arizona Mineral Withdrawal, which banned new mining claims around the Grand Canyon. Canyon Mine is located on Kaibab National Forest land south of Grand Canyon National Park. The mine sits above important groundwater resources, including the deep Redwall-Muav aquifer and shallower “perched” aquifers. These aquifers feed springs in and around the Grand Canyon. Springs are a critical natural resource in Grand Canyon National Park. They provide base flows to the Colorado River and drinking water to wildlife and park visitors, support habitats with exceptional species diversity, and hold cultural and spiritual significance for Native American tribes. We believe that mining Canyon Mine poses an unacceptable risk to the region’s springs, the regional aquifer, and the Havasupai Tribe’s sole source of drinking water. In December 2017, a three-judge appellate panel upheld the lower court’s decision disallowing the plaintiffs from challenging the Forest Service’s decision to exempt Canyon Mine from the 2012 mining ban. The Trust and our co-plaintiffs then filed a petition asking the entire court of appeals to rehear one of our arguments. Though the full court took a pass on that request, the petition ended up persuading the original panel to reverse its initial course and send the case back to the district court. The new ruling affirms our right to challenge the Forest Service’s “validity determination” for Canyon Mine under the Federal Land Policy and Management Act. The 1872 Mining Law allows prospectors to stake a claim on public land to mine gold, copper, and other “hard-rock” minerals, including uranium. But the quality, quantity, and other characteristics of the discovered ore must be sufficient to produce a profit after all mining and reclamation costs are paid for, including the costs of complying with laws meant to protect cultural resources and the environment. In appealing the decision to allow the Canyon Mine to operate despite the ban on new mining claims, we argued that the Forest Service failed to consider the real costs of the mine, including taking precautionary measures to minimize risks to the region’s groundwater and to protect plants, animals, cultural resources, and the public from uranium contamination. And those costs are going up. In 2017, Canyon Mine’s freshly sunk shaft flooded with groundwater from a documented “perched aquifer” that was encountered during exploratory drilling. The miners had underestimated the volume of water in the aquifer and overestimated the capacity of a containment pond meant to hold that water. After addressing the overflow threat by trucking surplus water to a uranium mill in Utah, water continues to pour from the aquifer into the mine shaft, where it is being continuously pumped into the pond for evaporation. The mine’s owners have since decided to stop mine construction because of the chronically depressed uranium market. Meanwhile, the owners are paying to operate and maintain the pumps that are constantly removing contaminated water from the mine shaft. The Forest Service’s original calculation of Canyon Mine’s profitability did not consider these costs. So the liabilities on the mine’s balance sheet, which we think the Forest Service got wrong to begin with, have only grown. The appellate court’s decision calls on the district court to again take up our argument that the Forest Service failed to consider all costs in calculating Canyon Mine’s profitability. That gives us the chance to keep pressing our argument that the mine should not be allowed to operate despite the ban. We believe that the Forest Service was wrong in permitting Canyon Mine to move forward without properly considering the consequences based on well-documented evidence about risks to the region’s groundwater. The agency failed to calculate the full cost of uranium mining in an area where the secretary of the interior had already deemed permitting new uranium claims too risky. We’re grateful to get another day in court. This decades-long fight to stop private profits from bankrupting our public interest isn’t over yet.